SRINAGAR, India , Jun 19 2012 (IPS) - A year after the Indian government began paying pregnant women to deliver their babies in state-run facilities, the pressure is showing on the country’s understaffed and poorly equipped hospitals. Between February and May, 397 newborns died at the G.B. Pant hospital in this city, summer capital of northern Jammu and Kashmir state, underlining deficiencies typical of government-run health facilities across the country. “My baby turned pale soon after a nurse administered an injection and he died moments after that,” Haleema Akhtar, a grieving mother, told IPS. “I saw over a dozen infants dying before my eyes in a matter of hours. The conditions at the hospital can only be described as inhuman. We could not afford to go to a private hospital,” a tearful Akhtar told IPS. An official inquiry into the deaths, conducted by Dr. Showkat Zargar, eminent physician and ex-officio secretary to the state government, blamed inadequate staff and equipment. “There is total apathy and mismanagement by the hospital administration,” Zargar said in his report. “Just one junior post-graduate student and a qualified nurse were looking after critically sick babies. I counted 27 (newborns) in a nursery, with no senior resident doctor posted in the neonatal intensive care unit,” Zargar reported. Citing the hospital’s records, the report said the facility had witnessed 981 infant deaths in 2010 and 985 in 2011, averaging a high 20 percent mortality – twice the accepted rate for state-run hospitals in India. The spate of infant deaths at the G.B. Pant hospital mirrored a similar episode at the district hospital in Malda, in West Bengal state, in November 2011. No fewer than 26 babies had died in a space of two weeks because of infection. On Mar. 20, India’s health minister Ghulam Nabi Azad, called to account in Parliament, admitted that India’s infant (under one year of age) mortality rate (IMR) of 47 per 1,000 live births was worse than in the neighbouring countries of Nepal, Sri Lanka and Bangladesh. “In India, the IMR is 47 per 1,000 live births, which translates into 1.25 million infant deaths per year,” Azad said. Only Pakistan had a worse IMR rate in South Asia, he said. A report released Jun. 13 by the United Nations Children’s Fund (UNICEF) as part of the ‘Countdown to 2015’ initiative placed India’s IMR rate slightly higher at 48 per 1,000 live births. The initiative tracks country-level progress in reducing maternal, newborn and child mortality and involves various partners. According to the UNICEF report, Pakistan has an IMR of 70 per 1,000 live births, followed by India with 47, Nepal with 41, Bangladesh with 38 and Sri Lanka with 26. The UNICEF report said most of these deaths are preventable through access to health services before, during and immediately after childbirth. 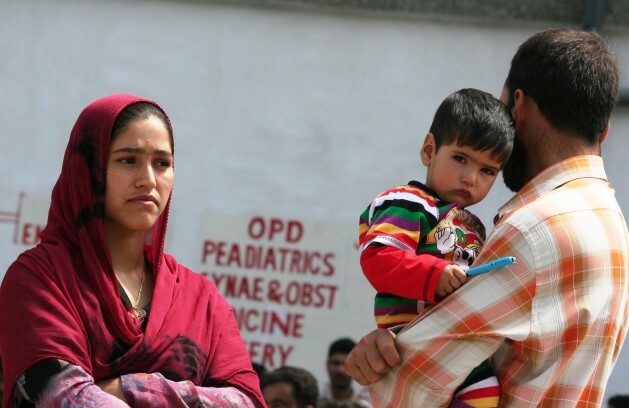 In the case of Jammu and Kashmir, according to official data accessed by IPS, there are only 24 pediatricians available to take care of over a million children below the age of six years. The Doctors’ Association of Kashmir (DAK) says that many of the hospitals not only lack child specialists but also basic life-saving equipment such as ventilators. “No doctor can work without the support of basic health infrastructure,” DAK president Nissar-ul-Hassan told IPS. In a bid to lower the IMR, the government launched in June 2011 the Janani–Shishu Suraksha Karyakram (JSSK), a programme to protect mothers and newborns, by providing a range of services free to pregnant women in government hospitals across the country. Cashless and free services under the JSSK include normal and caesarian section deliveries, care and proper diet for up to 30 days after delivery plus free transport from home to hospital and back. A sample registration system (SRS) survey carried out in 2010 by the Registrar General of India showed that initiatives to get pregnant women to avail of professional services were working with three-fourths of deliveries already happening in institutional settings. But there are vast differences in how programmes aimed at lowering the IMR were being implemented across this country of 1.2 billion people living in 27 states in a wide variety of settings. While states like Kerala, Tamil Nadu and Andhra Pradesh recorded less than one percent of births conducted by untrained midwives, Jharkhand state in central India still has 46.5 percent of births attended to by untrained traditional birth attendants. Prominent health activists welcome programmes like the JSSK but say the government needs to spend much more if it is to meet the millennium development goal (MDG) of reducing child mortality rate by two-thirds, between 1990 and 2015. Dr. Mira Shiva, coordinator of the non-government Initiative for Health, Equity and Society, points to the fact that where India’s public outlay on health was six percent of GDP in 1991, it had been whittled down to a little over one percent of GDP by 2011. “Naturally, such a drastic reduction in GDP spending has taken a toll on the public health delivery system – so it is not enough to get pregnant women to the hospitals and hand out doles,” said Shiva who is on several health committees. In February, the government had announced that by the end of India’s 12th five-year plan, due to be rolled out this year, spending on health would be increased to 2.5 percent of GDP – nominally placed at 1.67 trillion dollars in 2011. But Shiva said that would still work out to less than half of what many countries in situations comparable to that of India, such as Brazil, are spending on the health sector. According to a World Bank report published in 2010, public health expenditure in Brazil was 3.72 percent of GDP in 2008 but moved up to 4.13 percent of GDP in 2009.